Economy expanded by 26% last year, says CSO. Largely driven by aircraft purchases and assets re-locating to Ireland. Employment steady. Ireland debt-to-GDP ratio will fall to less than 80% as a result of new economic figures, says CSO. Apparently it’s GE Capital Aviation Services that became Irish last year, producing such a big spike in Irish GDP, GNP and IP. During RTÉ’s News at One, RTÉ’s Business Editor David Murphy spoke to Audrey Carville about the figures. Posted in Misc and tagged 26.3%, CSO figures, Economy expansion at 11:30 am on July 12, 2016 by Broadsheet. Well done FG for buying a load of planes last year? Great. The unsecured bond holders who gambled and lost on Anglo Irish bank, will get their money back even quicker. Blind optimism is for fools. Eoin is just telling it like it is. Moyler! Surprised you even see anything other than the sun, what with your blinkers on n’all. How so? And how can you “lose money” and “get it back”? Very odd. How so? Strange connection to make. Also curious to understand how, as you suggest, it’s possible to lose money and then get it back? Great news. I’m sure everyone in the country will see this massive increase manifest in their pay and/or services. 100%. Defintely. This is absolutely not completely meaningless news for the masses. cheaper borrowing for Ireland so more money to spend /invest/squander ? Hmmm. 26% increase. I don’t see it on main street. Anyone else? Partially due to ‘assets relocating’? Are they stock market and property purchases by millionaires/ billionaires who’ve borrowed fortunes and are buying up everything they can? Or is it real world economic recovery purchases? Because I’m really not seeing it if it’s actually real. And you won’t. But, hey, a few heads that own a company that sells fupping airplanes made a hefty profit last year so cashiers in Aldi should rejoice. At least I’m not a tedious dullard. I thought you appointed yourself BS spokesman to tell me “we” ‘loved’ me anyway? All change on that front? Translation; ‘I know you are but what am I?’ Thanks for immediately proving me right you absolute bore. So a jump in aircraft leasing, which is only a handful of companies with very few beneficiaries is the main reason for the jump? That means nothing in the long term. Tell that to the homeless families and the children on the poverty line, even though both their parents work. Would you prefer if we didn’t have successful aircraft leasing companies? Basically it’s a few companies transferring their balance sheets over to ireland. Nice tax loopholes to avail of here. So our economy is performing quite badly but an airplane shop made some profit last year so we’re all actually grand. Remember when the GDP figures were adjusted to include the wages of sin? 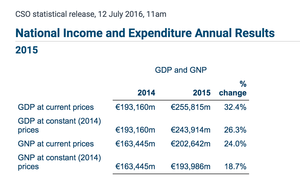 But yeah – corporation tax receipts and our debt/GDP ratio are the main benefits here. Deck the halls with lots of holly and lovely lolly and all types of ribbons and ballons, it be party time, christmas every day of the year. The celtic tiger or rather lion be back. If this is to be believed then Ireland, this little island, has an actual larger GDP, than states, Germany and Japan all put together. Ping, take the books out i think they are ready, fully cooked. So it’s a bunch of one off purchases that’s given us this 26% boost. So that means there’s gonna be a massive contraction in the GDP figures next quarter when we go back to normal? Crazy idea could they not remove the figures which distort the % and publish that figure ? not as simple as that. We do earn taxes on some of these figures. We do gain employment. You cant simply remove the figures. Also, other countries no doubt have some sort of distortions on their figures, even if not as large as on ours. So difficult to compare if you start subjectively adjusting.